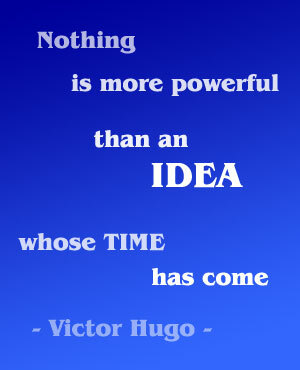 Create an outstanding organization now! John Miller believes that Outstanding! will do for organizations what QBQ! and Flipping the Switch have done for individuals. Outstanding! is all about 47 ways to be so exceptional that we draw the market to us rather than push it away. This book is for corporations, nonprofits, churches, schools, and government groups. John G. Miller, a Cornell University graduate and founder of QBQ, Inc., has worked with hundreds of Fortune 500 companies and governmental and nongovernmental organizations and thousands of individuals to help them make personal accountability a core value – and become outstanding. Miller, who has appeared on national television and radio, is the author of the bestselling “QBQ! The Question Behind The Question” and Flipping The Switch: Five Keys to Success at Work and in Life.” He lives in Denver with his wife, Karen. They have seven children. What is Outstanding! all about? What does being outstanding mean to you? Why is being outstanding imperative for both organizations and individuals? What moved you to write Outstanding!? What are some of the problems Outstanding! will solve for organizations? Is Outstanding! an extension of your books, QBQ! and Flipping the Switch? What is in your background and experience that leads you to be an expert in this area? 47 ways to change sounds daunting. Can you advise on how to begin? Every author has a favorite chapter or story. What’s yours? 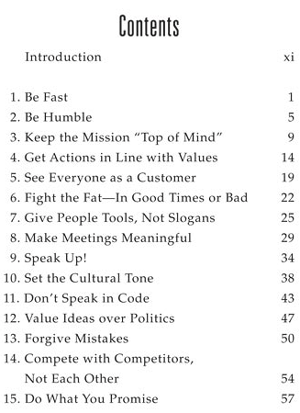 Though written for the organizational world, how can individuals/families use this book to be outstanding? How can CEOs or any high level executive help their staff become outstanding? You’re an expert in the area of personal accountability. How do accountability and being outstanding tie together? Where can people buy Outstanding!? Blessings to create an outstanding organization now! Tags: John G. Miller, John Miller, outstanding organization, outstanding organizations, Outstanding! 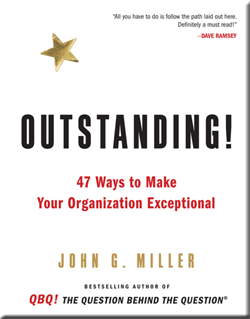 47 Ways To Make Your Organization Exceptional, QBQ! I am really looking forward to your webinar with John Miller tonight. Jerry Graham is the one who introduced me to the “QBQ” – what an awesome book. I then had to buy/read “Flipping the Switch” another excellent book, very practical, wise and as John states in the interview above, the information is not only applicable to work, but to family, relationships and how we conduct ourselves in every day life. I know this will be a fantastic webinar- can’t wait! .-= Shelley Grieser´s last blog ..The 10 Commandments for Divorced People =-. Thank you for your interest in the Outstanding! webinar with John G. Miller. That was great with lots of valuable life lessons. I’m sorry about the short notice. Please let your friends and followers know too. P.S. It’s neat that your name (Caren) is spelled with a “C” like our daughter. Not many people spell their name that way. Thank you for taking the time to share your enthusiasm about the Outstanding! webinar and the positive impact that John Miller has had on you. John’s book QBQ! had a very positive impact on me. The Outstanding! webinar on Feb 4 with John was great. I gleaned many valuable lessons from that. I’m confident that everyone who watches the recorded webinar will do likewise.